My name is Zoe Pagliaro and I am a junior environmental science major and political science minor at Skidmore. Outside of my unique hands-on and thought-provoking classes, I am involved in a range of activities that enrich my studies. 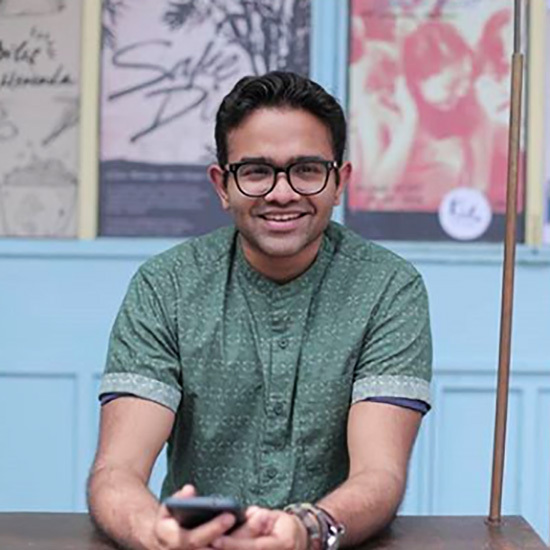 This year, I am an employee of the Sustainability Office, an admissions ambassador, a peer mentor, a peer academic coach, president of the Sustainability Commission and vice president of the Compassion for All club. Okay, I know it looks like a lot, but every club and position is an opportunity to be involved in something I love. And what’s more important than that? Here’s a look at one of my weeks in pictures, filled to the brim with things I’m passionate about. 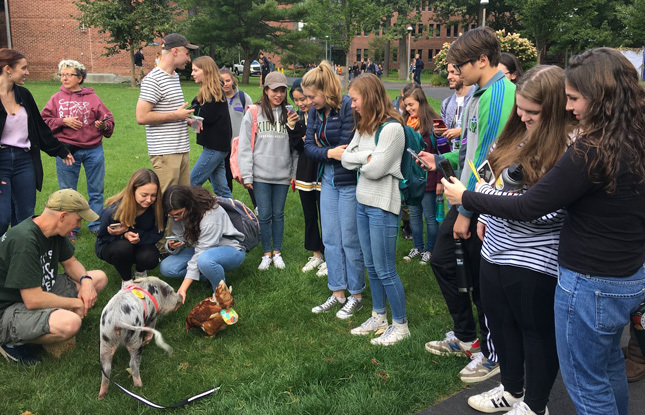 As the vice president of Skidmore’s animal rights club, Compassion for All, I host several events throughout the semester to share our message. To begin the week, I helped set up a screening of the award-winning documentary, “The Last Pig.” In addition to the screening, I invited two guest speakers, Bob Comis, the farmer featured in the film, and Ryan Phillips, an animal rights activist, to speak and address questions after the film. Ryan also brought three rescued pigs and two rescued chickens to meet the Skidmore community throughout the day! Every Wednesday, I set up a booth in the dining hall to promote Skidmore’s Low Impact Wednesday program. This is a Sustainability Office program that I help run as one of the College’s sustainable dining communications managers. 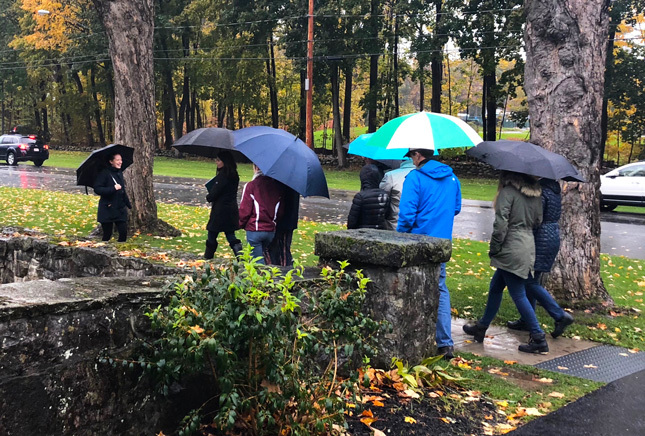 As a team, we work to help our Murray-Aikins Dining Hall offer more sustainably sourced options that are local, fair, ecologically sound and humane and also are from conscientious companies. Pretty cool, right? 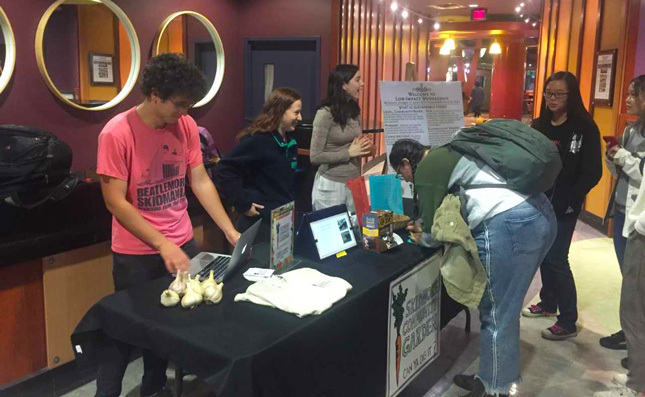 This semester, we are also working to educate the Skidmore community about issues within the food system such as food insecurity, the environmental impacts of different foods and gender discrimination in farming, and food waste. Stop by the table every Wednesday for some weekly sustainability trivia and the chance to win some Fairtrade chocolate! As the peer mentor for the first-year Scribner Seminar, “What to Eat?” I have the unique opportunity to both take this fascinating class alongside my first-year mentees and serve as an academic and social resource for them. 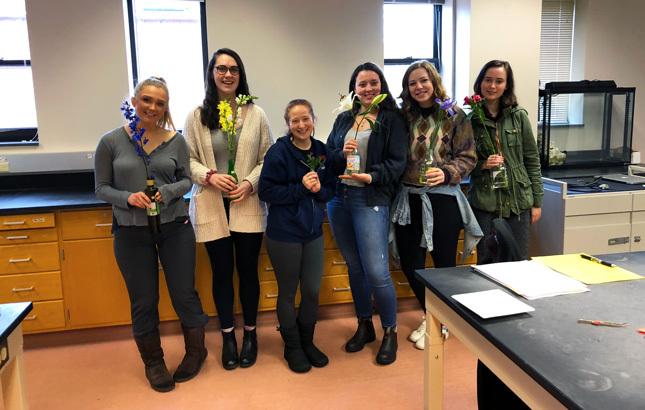 In class this Thursday, we examined a variety of different flowers to learn about how they attract different pollinators. This was one unit in a larger course that explores the ecological, biological, social, political, cultural and ethical reasons that we and other organisms choose what to eat — something to think about next time you make your way around the dining hall! 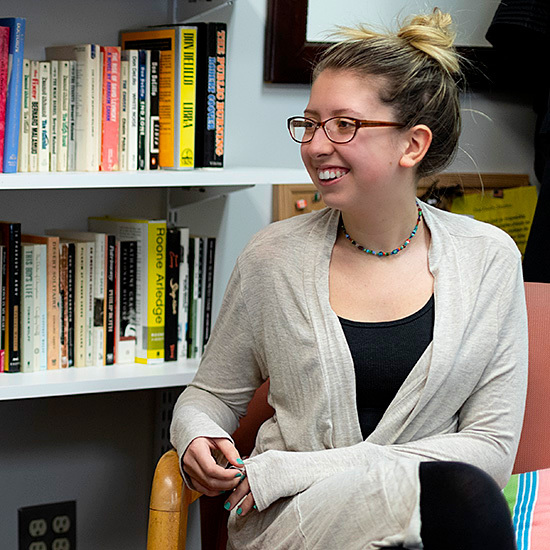 The Scribner Seminar is a required course for all first-year students that fosters critical connections between the first-year students, their faculty adviser and an upperclassman. This course also serves to help develop and strengthen writing and presentation skills, and expose students to dynamic discussions, all while exploring an exciting topic of their choice. Happy Friday! 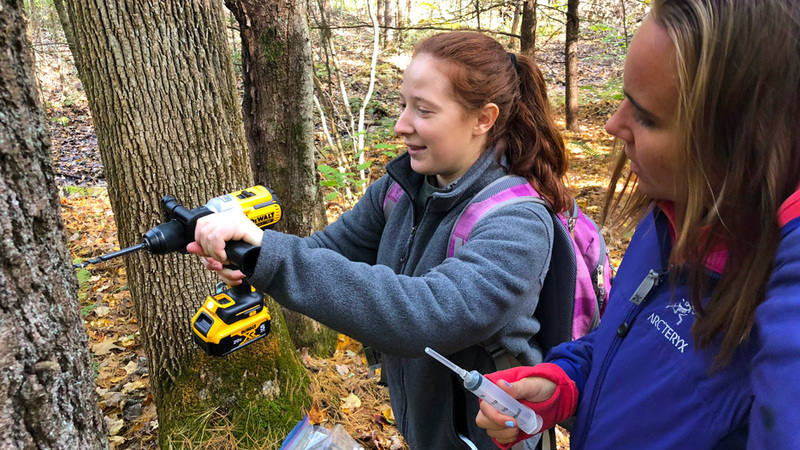 One of my favorite things about the Environmental Studies and Sciences Program is that it offers a lot of hands-on, field-based courses. Every week, we get to go out in the field whether it’s to the North Woods on campus, the Adirondack Mountains or a local farm. 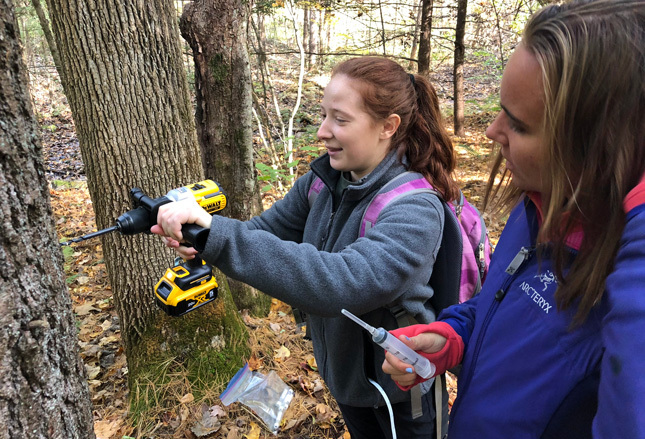 In lab this Friday, we went out into the North Woods to learn how to extract gas samples from different trees. P.S. I spent my summer as North Woods steward, you can read about that here! On Saturday, I had the honor of attending the groundbreaking ceremony for Skidmore’s new Center for Integrated Sciences. 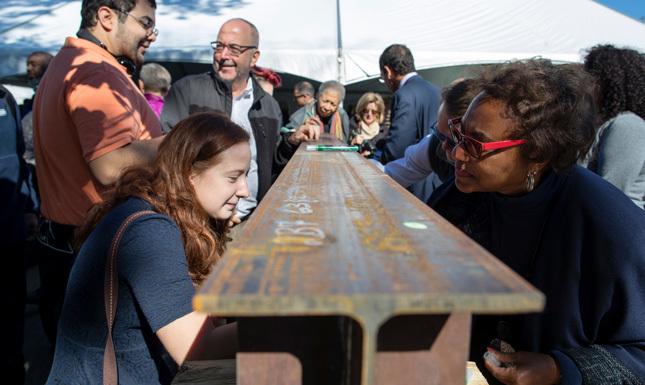 This is one of Skidmore’s largest projects that will enhance the sciences at Skidmore and increase collaboration between various science programs and departments. At the event, we heard from several faculty members, President Glotzbach and the keynote speaker, Neil Shubin. 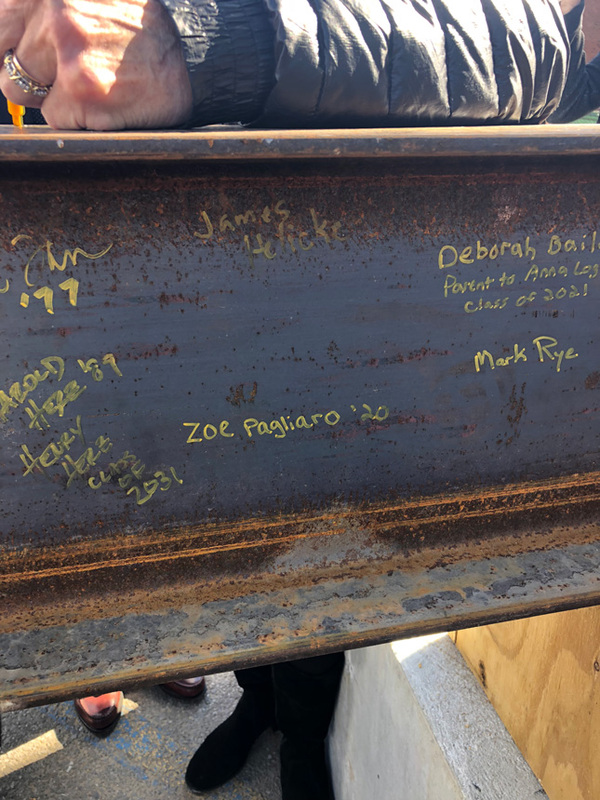 We also got the chance to write our names on the first beam of the new building! My Sundays are spent volunteering in Skidmore’s Community Garden where we grow organic vegetables for the dining hall. This Sunday, we harvested the last crops of the season and got the beds ready for the winter. 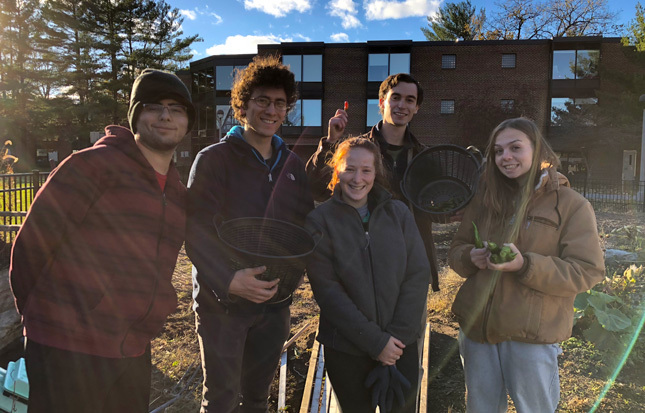 The garden is run by Skidmore students and every year we grow about 1,000 pounds of produce! From the beginning of the week to the very end, my passion for and dedication to the environment never fades. 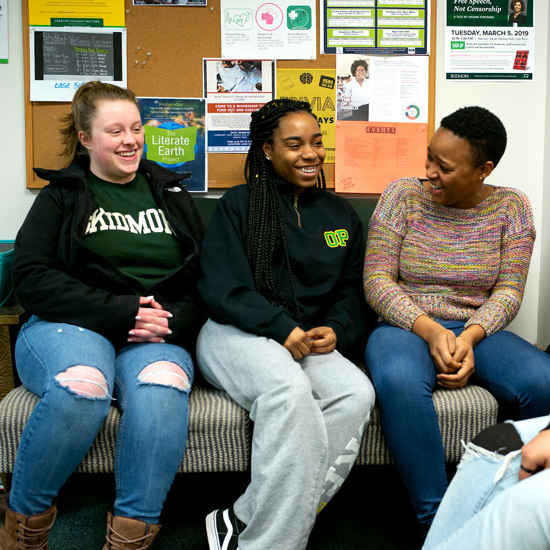 Thanks to Skidmore, my days are packed with classes, jobs and clubs that allow me to make a positive difference on this campus. Whether you find me in North Woods, the dining hall, the community garden or class, I’m always doing what I love. Zoe Pagliaro, from South Kingstown, Rhode Island, is a junior majoring in environmental science and minoring in political science at Skidmore. You can find her working in the Sustainability Office, giving tours to prospective students, or presenting for her environmental and animal rights clubs on campus.